Julio César Zuluaga Jiménez Asistente Graduado, Universidad de los Andes, Colombia. Iván Darío Sánchez Manchola Profesor Asistente, Pontificia Universidad Javeriana Bogotá, Colombia. Fernando Barrios Aguirre Profesor Asociado, Universidad Jorge Tadeo Lozano, Colombia. El objetivo del artículo es proponer un modelo de análisis multinivel de la innovación. Se exponen los debates acerca de los efectos del ambiente regional sobre el desempeño innovador de las firmas y se sostiene que la innovación se debe comprender desde una óptica multinivel que incluyan las características del ambiente regional así como las capacidades de la firma. Para lograr este objetivo, se construyó un modelo estadístico multinivel, el cual arrojó evidencia sobre los beneficios de este enfoque en la innovación empresarial. Los resultados sugieren el enfoque multinivel para futuras investigación sobre innovación. Julio César Zuluaga Jiménez, Asistente Graduado, Universidad de los Andes, Colombia. Iván Darío Sánchez Manchola, Profesor Asistente, Pontificia Universidad Javeriana Bogotá, Colombia. Fernando Barrios Aguirre, Profesor Asociado, Universidad Jorge Tadeo Lozano, Colombia. Anselin, L. (2010). 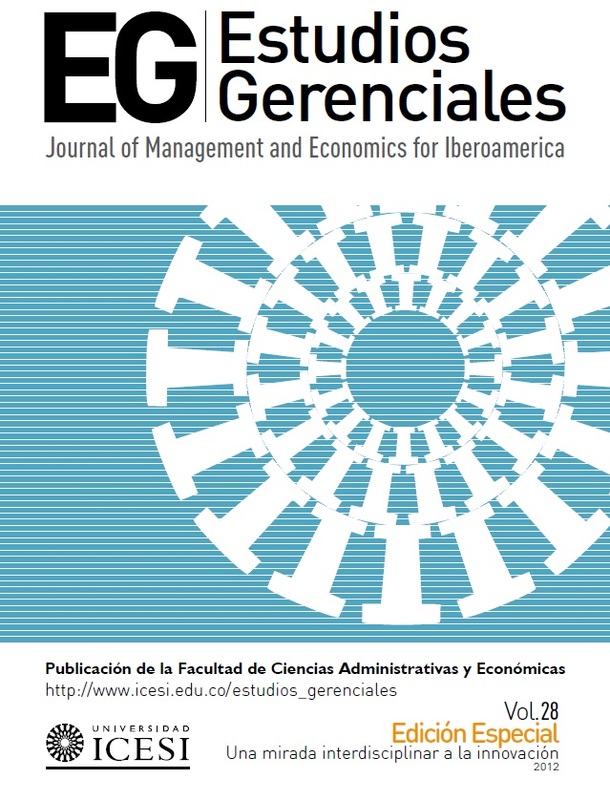 Thirty Years of Spatial Econometrics. Papers in Regional Science, 89(1), 3–25. Audretsch, D. & Feldman, M. (2004). Knowledge spillovers and the geography of innovation. En P. Nijkamp (Ed. ), Handbook of regional and urban economics (Vol.4, Ch. 61, pp. 2713-2739). Amsterdam, New York, North-Holland: Elsevier. Austin, P., Goel, V. & Walraven, C. (2001). An Introduction to Multilevel Regression Models. Revue Canadienne de Santé Publique, 92(2), 150-154. Bathelt, H. (2005). Cluster relations in the media industry: Exploring the ''distanced neighbor'' paradox in Leipzig. Regional Studies, 39(1), 105-127. Beugelsdijk, S. (2007). The regional environment and a firm's innovative performance; a plea for a multilevel interactionist approach. Economic Geography, 83(2), 181-199. Bryk, A.S. & Raudenbush, S.W. (1992). Hierarchical Linear Models. Applications and Data Analysis Methods. Newbury Park, CA: Sage. Desrochers, P. (2001). Geographical Proximity and the Transmission of Tacit Knowledge. Review of Austrian Economics, 14(1), 25-46. DiMaggio, P.J. & Powell, W.W. (1991). Introduction. En W.W. Powell & P.J. DiMaggio (Eds. ), The new institutionalism in organizational analysis (pp. 1–38). Chicago, IL: University of Chicago Press. Feldman, M.P. (2000). Location and Innovation: The New Economic Geography of Innovation, Spillovers, and Agglomeration. En G. Clark, M. Feldman & M. Gertler (Eds. ), The Oxford Handbook of Economic Geography (pp. 373-394). Oxford, UK: Oxford University Press. Gittelman, M. (2007). Does Geography Matter for Science-Based Firms? Epistemic Communities and the Geography of Research and Patenting in Biotechnology. Organization Science, 18(4), 724-745. Gordon, I.R. & McCann, P. (2005). Innovation, agglomeration, and regional development. Journal of Economic Geography, 5(5), 523-543. Gupta, A., Tesluk, P. & Taylor, M. (2007). Innovation At and Across Multiple Levels of Analysis. Organization Science, 18(6), 885-897. Jaffe, A. (1986). Technological opportunity and spillovers of R&D. American Economic Review, 76(5), 984-1001. Jaffe, A. (1989). The real effects of academic research. American Economic Review, 79(5), 957-970. Jaffe, A., Trajtenberg, M. & Henderson, R. (1993). Geographic localization of knowledge spillovers as evidence by patent citations. The Quarterly Journal of Economics, 108(3), 577-598. Klein, K.J., Dansereau, F. & Hall, R.J. (1994). Levels issues in theory development, data collection, and analysis. Academy Management Review, 19(2), 195–229. Kozlowski, S.W.J. & Klein, K.J. (2000). A multilevel approach to theory and research in organizations: Contextual, temporal, and emergent processes. En K.J. Klein & S.W.J. Kozlowski (Eds. ), Multilevel Theory, Research, and Methods in Organizations (pp. 3-90). San Francisco, CA: Jossey-Bass. Lambert, D. (1992). Zero-inflated Poisson regression, with an application to defects in manufacturing. Technometrics, 34(1), 1-14. Lawrence, P.R., & Lorsch, J.W. (1967). Organization and environment: Managing differentiation and integration. Boston, MA: Harvard Business School Press. Lee, A. & Wang, K. (2006). Multilevel zero inflated Poisson regression modeling of correlated count data with excess zeros. Statistical Methods in Medical Research, 15(1), 47-61. Long, J.S. (1997). Regression Models for Categorical and Limited Dependent Variables. Advanced Quantitative Techniques in the social Sciences series. Thousand Oaks, CA: Sage. Lundvall, B.A. & Borrás, S. (1998). The Globalising Learning Economy: Implications for Innovation Policy. Targeted Socio-Economic Research Studies, DG XII, Commission of the European Union. Luxembourg: Office for Official Publications of the European Communities. Melgar, M.C., Ordaz, J.A. & Guerrero, F.M. (2005). Diverses alternatives pour déterminer les facteurs significatifs de la fréquence d'accidents dans l'assurance automobile. Insurance & Risk Management, 73(1), 31-54. Rabe-Hesketh, S. & Skrondal, A. (2008). Multilevel and Longitudinal Modeling Using Stata (2a ed.). College Station, TX: Stata Press. Rondé, P. & Hussler, C. (2005). Innovation in regions: What does really matter?. Research Policy, 34(8), 1150-1172. Rousseau, D.M. (1985). Issues of level in organizational research: Multi-level and crosslevel perspectives. En L.L. Cummings & B. Staw (Eds. ), Research in Organizational Behavior (Vol. 7, pp. 1-38). Greenwich, CT: JAI Press. Scott, W.R. (2003). Organizations: Rational, natural, and open systems. Englewood Cliffs, NJ: Prentice Hall. Sniders, T. & Bosker, R. (1999). Multilevel analysis. An introduction to basic and advanced multilevel modeling. Thousand Oaks, CA: Sage Publications. Varga, A. (2006). The Spatial Dimension of Innovation and Growth: Empirical Research Methodology and Policy Analysis. European Planning Studies, 14(9), 1171-1186. Winkelmann, R. (2008). Econometric Analysis of Count Data (5a ed.) New York, NY: Springer Press.